When polishing silver jewellery with my Dremel Rotary Tool or Dremel Flexible Shaft there are a few different tools that I like to use. I'm going to share my 4 tips on how to polish metals without fuss or mess! A few of my other favourite methods will be highlighted at the end too. I have a variety of silicone polishers that I like to use for working on larger surface areas. The first set of polishers I use come in a range of shapes: Wheel, Knife Edge, Cylinder and Bullet and they attach to dedicated mandrels so you can fit them into your Dremel Rotary Tool. 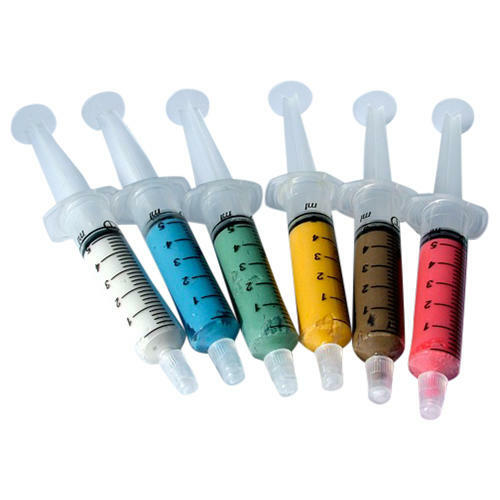 You don't have to use any compound or rouge with them so less mess. The 'magic' is encased in each polisher so they're ready to use a they are. They come in a range of different grades of grit from coarse (White), medium (Black), Fine (Blue) through to ultra fine (Pink) and can be used dry on a variety of materials: precious metals, non-precious metals, glass, ceramics, acrylic, enamel, composite materials, synthetic materials and porcelain. White - Coarse for quick removal of material. Black - Medium for Pre-polish, removes scratches and leaves a smooth surface. Softer than white and more flexible. First I begin with the white, then black, blue and finally pink. If the piece has some detailed or tricky to reach areas that need to be polished I'll use the Silicone pin polishers or radial bristle discs, but more about that later. 1) Begin with the white polisher to remove any surface scratches. Essentially the grit of the white polisher has been designed for the removal of material so you want to be careful with this polisher. Keep your drill moving at all times to avoid fixating on any one area otherwise you may end up with a groove where you don't want one! Feel over your work for any sharp edges or extra solder. If all is good, rinse off and move onto the black polisher. 2) Use the black polisher to remove any remaining scratches and smooth over the surface. At this stage you'll have a good shine, no surface scratches and your work will be smoothed over nicely. You'll notice a bit of dust coming off with these polishers so do wear safety googles and a mask. Again, rinse or wipe off after use. The reason for wiping or washing off the dust after each polisher is so you don't leave any residue of the coarser grits on you work, otherwise you may end up adding extra surface marks as you're trying to polish them out. If you have any tricky to reach areas or intricate parts of your work this is when I move onto using the Silicone Pin Polishers otherwise continue on and use the Blue polisher followed by the pink for the final mirror finish shine. 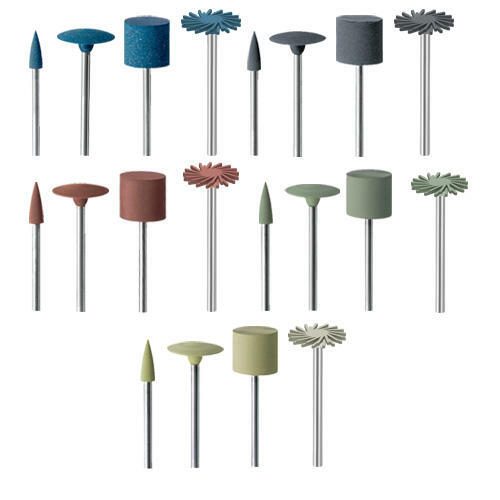 Another superb set of polishers from Germany company EVE is this range of mounted and unmounted rubber polishers for work on metal. These polishers are made of a rubberized compound which is impregnated with abrasive particles, so this gives the advantage that they're used dry and don't need any polishing compound, so hardly any mess or clean up. This makes them ideal for quick touch up jobs and small detailed work. The silicone pin polishers come in a range of grits much like the silicone polishers. They can be filed down to a point with an emery or diamond file, whatever you have to hand, and they are ready to use, you don't need any compound. Use them dry. They are 3mm in diameter so very small, and you just push them into a dedicated pin mandrel then into your Dremel Rotary Tool. So, before moving onto using the Blue and Pink mini rubber silicone polishers as mentioned above I'll use the polishing pins to clean up and polish the detailed areas of my work that I can't reach with the other silicone polishers. I'll start with the grey if there is no solder or snags to be removed. If the silver jewellery I'm working on is very small and very detailed then I could do the whole surface with these pin polishers. 4) Now go back to the mini rubber silicone polishers, using the blue one and then finally the pink one over the whole piece. You'll now have a super shiny, high gloss sheen to your finished piece of work. Helpful note: The whole pin is impregnated with grit, so for larger flat surfaces, you might wish to pull a bit more of the pin out of the mandrel and use the flat side to give you a bit more flexibility. Alternatively, if you want to use a shorter pin, it will be stiffer and allow you to use a bit more pressure on the tip. These little discs are slightly smaller than a 10 pence piece (and slightly larger than a dime) at 22mm. They're ideal for polishing small scale metal pieces of work such as jewellery, and they work a real treat. There are three grades and it's best to use all three consecutively, working your way through from Green which is medium grit, then the fine Orange and finishing with the Pink which is extra fine. Using them in this way will result in different textures along the way so if you like the lustre that the green has left, stop there. Otherwise move on to the orange and pink to leave you with a really nice sheen on your work. They will also work on glass and stone so if the piece you are working on has mixed materials, even better. They are made of cotton and impreganted with the abrasive, aluminium oxide. Attach them to a regular screw mandrel and fix into your Dremel, pendant dril or flexible shaft and set the speed to between 5,000-7,000 and away you go! When you're polishing fine, intricate jewelry, you can spend longer cleaning off the polish than you do actually making or repairing. Wouldn't it be great if there was some way of polishing fine, intricate jewelry, but without making a mess? Here's where the radial bristle discs come into their own. These contain an integrated abrasive meaning you don't need to use any polishing compound, such as jeweller's rouge or tripoli. Use them dry. 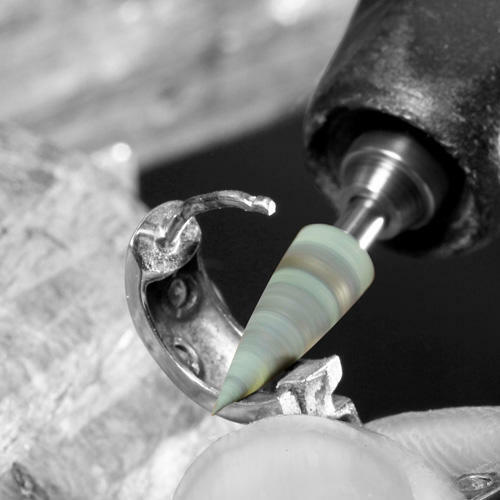 The discs are designed for use in a pendant drill or rotary tool, such as a Dremel. Simply stack 2 of the same grit discs on a screw mandrel making sure to face them the correct way. There is a full range of five different grits, and each one is a specific color. I recommend a selection of three grits, a rough one for removing oxides (Blue or Dark Grey), a medium grit for further removal of light oxides and pre-polishing (Brown), and then a finer one for semi-finishing and blending (Green and Beige). 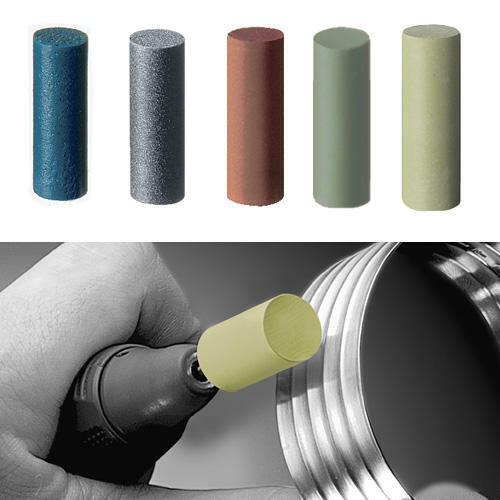 If you are working with set stones, gold or silver try the EVE Pumice Twist Radial Polishing Discs. I use grey and brown rubber polishers to smooth out the roughness on metals particularly on platinum, gold and argentium silver. However, they can be used on all non-ferrous metals such as chrome, titanium, platinum, gold and silver, plus steel and stainless steel, resin,enamel, acrylics and glass. They are all mounted on a steel shank, except for the wheel shape which simply attaches to a screw mandrel, then into your Dremel. Again, they come already impregnated with grit so you can use them dry just as they are, no need for any additional compound. There are a multitude of felt polishers, mops, cones, brushes and points that are mounted on steel shanks that you can pop into your Dremel. It's good to have a selection of all the various polishers as some will be good for certain jobs. Some of the essentials to add to your tool kit would be some felt polishers, some cotton buff mops, a black wheel bristle brush, calico wheel mops and some polishing compounds such as diamond polishing paste which work wonders on hard metals, or Dialux compounds as shown below. Diamond Paste on silver: In recent tests it has been found that by using the 8 micron first, followed by the 3 micron and finishing with the 1 micron leaves a wonderful mirror finish to silver. 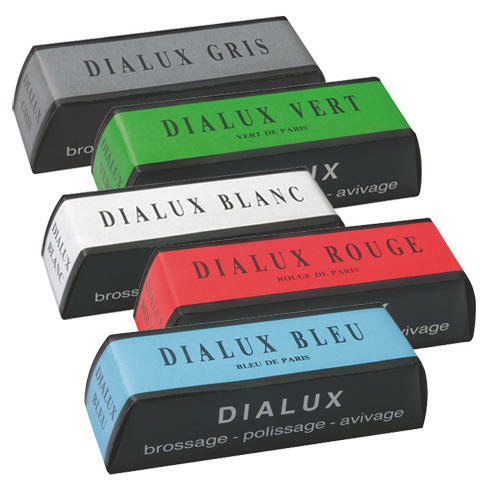 Dialux have a range of polishing compounds which replace the tripopli and rouge of old as they create less mess and the quality is sublime! Just a little added note to say that if you don't already have a Dremel Multi Chuck, then it's worth purchasing one. The Dremel Multi Chuck makes changing polishers and attachments super easy. There's no need to worry about what size shank the polisher has, and unlike the Dremel Collet Nut Kit you won't have to keep changing collets all the time. In my kit, they are an essential and I have one attached to my Dremel 3000 and another on my Dremel Flexible Shaft at all times. Please always wear good eye protection, a dust mask and ensure you have on a long sleeved top and apron when using any of the above products. I hope you've enjoyed my 4 top tips for polishing your metal jewellery without fuss and without mess.